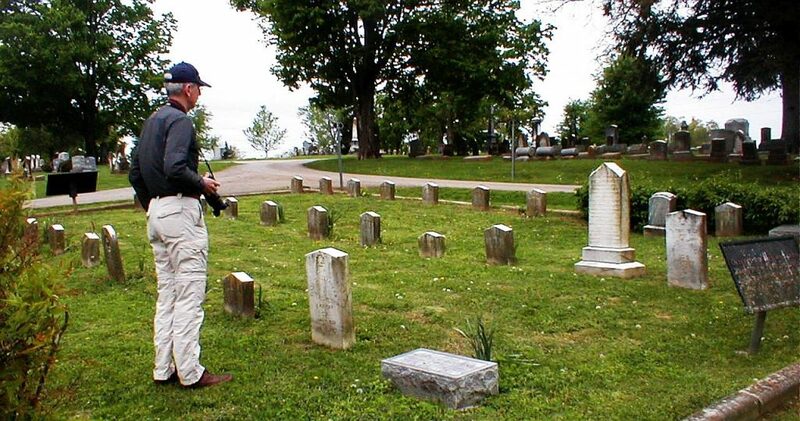 Dan Pence, President of the James-Younger Gang, views the plot for the Confederate dead in Spring Hill Cemetery in Harrodsburg, Kentucky. April 19, 2017 – Dan Pence and Tom Nall, president and past president of the International James-Younger Gang Inc., will arrive at the 200-year-old Hemp House here in Danville today. Then for three days, we will tour Kentucky and preview historic sites in preparation for the speaking events and tours that are scheduled for the 2017 annual conference in Georgetown come September. Today, we will begin at Constitution Square. We will talk about the enduring relationship between John M. James, Frank & Jesse’s grandfather, with Judge Harry Innes, his clerk & later Justice Thomas Todd, & Benjamin Sebastian of the Spanish Conspiracy. We will also address what role John M. James may have had in the ten Danville Conventions and how the Spanish Conspiracy led to his ruin. Next, we will retrace the ride of Frank James, the Younger & Pence brothers with William Clark Quantrill when they rode through Danville in 1864 on a mission to “visit” President Lincoln. At the family plot of the close Confederate ally of Frank James, John Pendleton “Black Jack” Chinn. 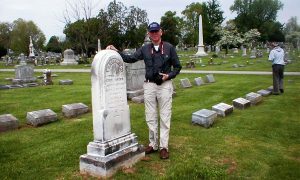 Dan Pence stands beside the tombstone of Black Jack’s grandmother, Sarah White Stull Hardin-Chinn. Her husband Christopher Columbus Chinn is the namesake of Kit Chinn who traveled the racetrack circuit with Frank James in his retirement years. Black Jack rests behind Dan Pence among two rows of his Chinn and Morgan families. We will then tour Oakland Church cemetery where Quantrill ordered their fallen men to be buried. 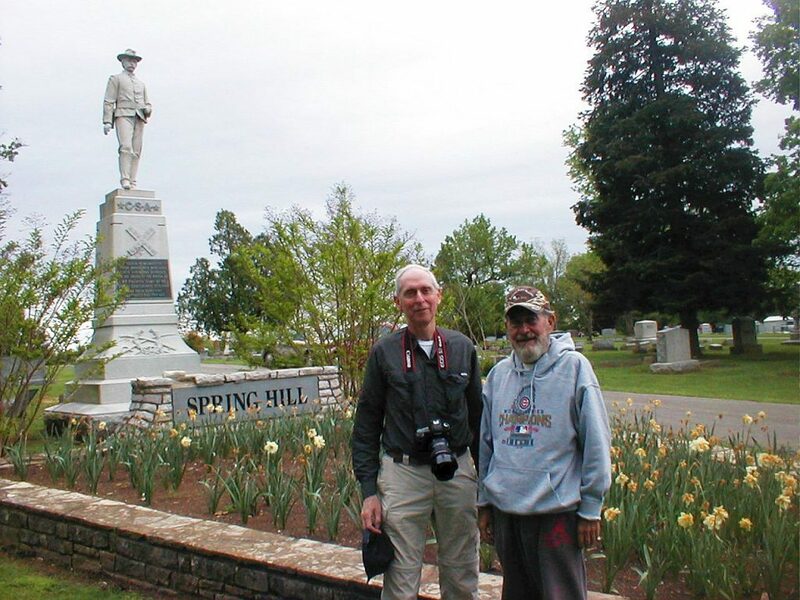 We also will visit Spring Hill Cemetery in Harrodsburg, where Frank James and Black Jack Chinn exhumed their slain from Oakland Church Cemetery and re-interred them in the Confederate plot at Spring Hill around 1898. Nearby the family plot of Black Jack Chinn, Dan Pence tours the family plot of Franklin Pierce “Frank” James. In Harrodsburg, Frank James was the cashier of the Mercer County National Bank. Black Jack Chinn sat on its board of directors. Frank was twice elected Sheriff of Mercer County, and also was elected State Auditor. 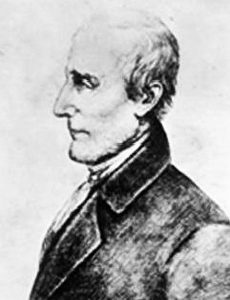 He halted construction of the new Kentucky State Capitol when the legislature failed to appropriate sufficient funding. 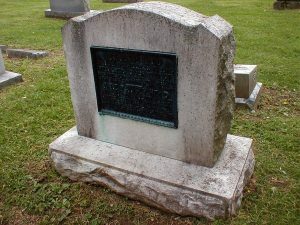 Returning to Danville, we will visit Bellevue Cemetery and the grave site of the grandparents of Clell Miller, Henry Logan Thurmond & Mary Kenley-Thurmond. Clell Miller was one of the James-Younger Gang. He was killed in the Northfield Bank robbery. We will round off today’s tour in Danville with visits to Weisiger Park next to the Boyle County courthouse where Joseph McAlister James, aka Joseph McJames, operated the St. James Hotel. We also will stop by the parking lot on Third St. backing up to the Boyle County jail where Joseph McJames owned and operated James Hall, Danville’s first and original theater, and convention center. In the coming two more days, we plan to tour in Woodford and Scott Counties. Tombstone of Thomas Evans James, brother of Franklin Pierce “Frank” James. T.E. James operated the oldest dry goods firm in Harrodsburg – Hansford, James, & Co. His partner Smith Hansford rode with John Hunt Morgan, David Hunt James, & Richard Skinner James, both of whom were captured and sent to Camp Douglas Union Prison Camp in Chicago. 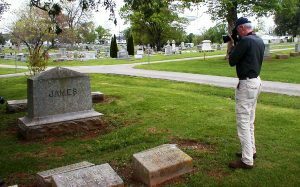 April 20, 2017 – Yesterday, after a full day of touring numerous historic sites relating to the pioneer settlement of John M. James in Kentucky and his pioneer families of Pence, Nalle, Vardiman, & Sallee, we ended our tour at Bellevue Cemetery in Danville. 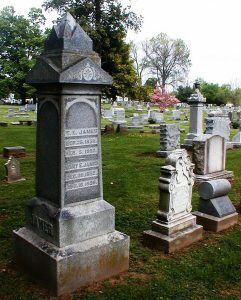 Behind the tombstone of Thomas Evans James, Tom Nall spotted the tombstone of Rev. 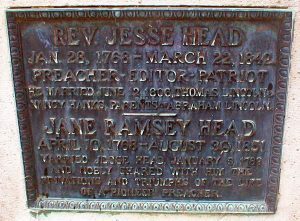 Jesse Head. Rev. Head married President Abraham Lincoln’s parents, Thomas & Nancy Hanks Lincoln. Dan’s grandfather is Samuel Anderson Pence, the author of I Knew Frank…I Wish I had Known Jesse. This book and its companion book Quantrill’s Guerillas 1861-1865 compiles Pence’s lifetime accumulation of history, stories, facts, and data relating to Pence’s personal relationship with the social communities and family of Frank & Jesse James. Dan edited and published his grandfather’s book posthumously. So much of Dan’s book is new and previously unpublished history. I have used this book often in my own research and writing. I was thrilled to think Dan thought so kindly about my research and writing. Dan’s generous compliment could not have thrilled me more. Today, we continue our tour in Georgetown and Midway and the historic site related to the James family there. April 21, 2017 – So far, very few complications have arisen regarding our programming for the September conference. Everything is working out well and in some cases better than first thought. This conference is going to be great! However, while conducting our tour, revelations have occurred to us which surprised us. There really is no reason why the three of us, all raised in the upper Midwest, should find ourselves bound together by Jesse James. Yet, here we are. 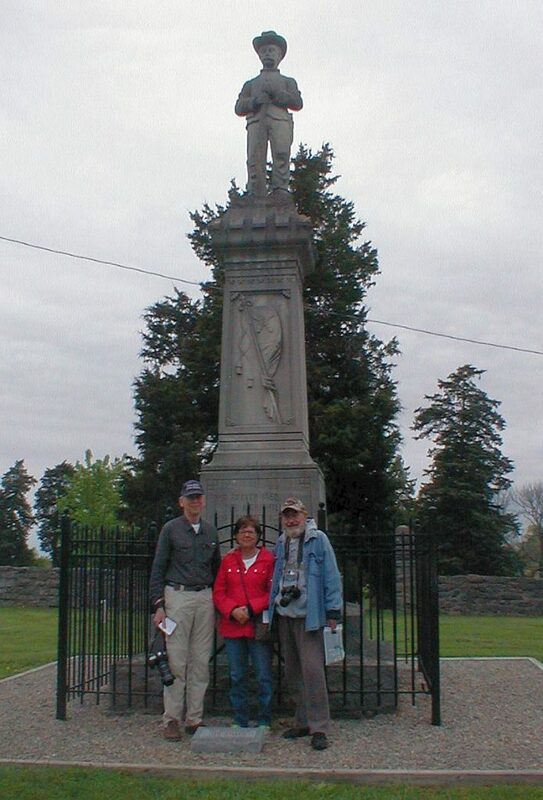 Dan Pence, Tom & Barbara Nall tour Perryville Battlefield and its memorial to the Confederate dead. As a trained chemist, grown up In Michigan, Dan knew nothing of his connections to Jesse James. Not until Dan’s son brought home a book one day about Jesse James and Dan began to look at his grandfather’s box of memorabilia, did Dan begin to follow his path of spiritual discovery. 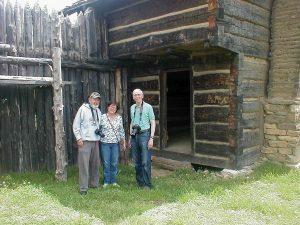 Dan Pence, Tom & Barbara Nall tour Logan’s Fort, a first stop for any migrant coming to Kentucky from Virginia in the early 1780s, including Frank and Jesse James’ grandfather, John M. James. Following the neglected leads left to him, Dan began his journey. Dan’s door of discovery opened when a near stranger instructed him “You have to go to Kentucky. When Dan did, like me Dan discovered the unexpected. In the Kentucky corporate offices of Maker’s Mark Bourbon, Dan met with Bill Samuel. Bill showed Dan Bill’s own neglected box of family memorabilia. Among the artifacts in Bill’s box were photos of Dan’s grandfather, great-grandfather, and great-great-grandfather. Ever since then Dan has been on his own personal tour to discover what meaning Jesse James holds for him. Even on this preview tour of historic sites in Kentucky and after publishings his grandfather’s books, Dan is still learning more. The three of us boys from the upper Midwest agree. We are traveling a curious path of divinity. We fully expect more revelations to come. Come to Kentucky, and you can, too. Join us and tour with us at the 2017 annual conference of the James-Younger Gang.